We are in the midst of award season with this past weekend’s Grammy Awards as the latest edition. Awards shows always bring a great fashion spectacle, from gowns to makeup to glamorous hairstyles. We all love to watch to see what the current trends are, and this year there is one particular trend that we are LOVING. You all know how much the Garnish team loves curls (as so many of us are curlies), and we were thrilled to see so many stars rocking their natural curls on the red carpet and the Grammy’s stage. We’re all about hair health and loving your own curl pattern, and it’s great to see celebrities showing the world that every texture of curl can be glamorous and beautiful. Check out some of our favorite curly looks from the red carpet. As, you know, we love Curls here at Garnish Hair Studio + Extension Bar! If you’re ready to rock your curls and need some help styling, revitalizing, or just want to know the best curl product for your particular curl pattern, give us a call! 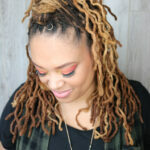 We can set you up for a consultation with one of our stylists, or walk you through a great curl regimen. 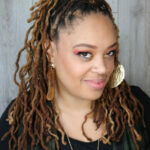 Stay tuned for our upcoming Valentine’s Blog about the all new Davines “LOVE” Curl Line. New Year, New 2018 Hair Trends! The Garnish gang got together and talked about what we thought would be the upcoming #hairtrends in 2018 and here’s what we’re prettyyy sure you’re going to see a lot of in the upcoming year. Did you catch our blog post on lived-in hair and why it’s one of our favorite hair trends? The lived-in look is not going anywhere, and top knots have officially joined braids and waves as an acceptable messy look. Top knots are super easy and cute while still being functional, so of course, we love them. Highlighted hair and Dimensional hair CAN look very different, and we think subtle dimension is about to be all the rage. No more super light ‘lights… We’re anticipating that rich chocolates and beautiful auburns are going to take over the haircolor scene in 2018. Not everyone can pull off a middle part, and not everyone wants to, but for those that can and do… 2018 is going to be all about ‘em. Particularly when paired with tousled texture that makes the middle part look so effortless and amazing. We know it feels like late 90’s hair is back, and maybe it is.. There’s nothing wrong with a good throwback trend! A great haircut cannot be understated, and going along with the lived-in hair look, we are loving the haircuts that are so perfect for your hair texture and style that you can just get up and do the quickest styling sesh ever (optional) and then run out the door. When the cute cut IS the style… you’re definitely winning the hair game. Over the past few months we’ve noticed a trend that we foresee continuing all the way through 2018. Women are ready to really focus on restoring the health of their hair if it’s been damaged, or to maintain their healthy hair. 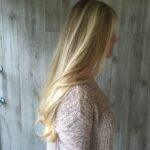 Healthy hair means committing to a healthy color process (even if that means it takes 6 months to go blonde), and using quality products (that won’t buildup or damage your hair further). Healthy hair means more gorgeous, shiny, amazing hair in 2018! Which trend are you most looking forward to in 2018? Last year we created a Garnish Goal of helping as many women as possible discover their #hairgoals and begin down the path to achieving their hair dreams. This year we are reintroducing our #hairgoals worksheet so you can revamp last year’s goals, or create brand new ones. You will be able to download this fun and fast #hairgoals form and bring it in to share with your stylist or you can ask the front desk team for a copy when you arrive for your visit. January is always a month of reflecting on what you hope to achieve in the next year. Make your #hairgoals a priority and allow Garnish to help you become the best version of you in 2018. With only two weeks left until Christmas, it’s crunch time for finding the perfect gift for your bestie, mom, and big sis. If you’re anything like us, we find any excuse to avoid the parking decks at the mall this time of year, so we thought we would help you out with some ideas. We’ve put together the perfect collections for all of the hair-loving ladies in your life. • A Cowash such as R+Co’s Analog or Kevin Murphy’s Restore. • R+Co Twister Curl Primer aka the anti-frizz prep cream that makes all her other curl products work even better. • Davines Curl Building Serum for curl enhancing and shine or LOVE curl revitalising spray. • Davines Hair Refresher aka dry cleansing, scent refreshing, and volume boosting. • Travel Size Shampoo & Conditioner to toss in the gym bag (duh). • Davines Doo Over for second day hair refreshing. • R+Co Badlands for texture at the root and oil absorption. • Davines perfecting hairspray for definition and hold for those lived-in waves. • R+Co’s One Prep Spray, a spray that provides benefit to all hair types. • A Garnish Gift Card… can be used on all services or products to help her reach her hair goals no matter what they may be. • Davines Body Butter, because who doesn’t love a luxurious, skin-nourishing cream. • O&M Know Knott Detangler… one of our best seller’s for a reason. All giving shine and shimmer to hair.. and who doesn’t love shiny hair?! Do you have Lived-in Hair? If you keep up with the fashion trends (as we love to do), you may have heard the term “lived-in” hair before. It sounds cool, but what exactly does it mean? Lived-in hair refers to a style or vibe more than one particular look. Imagine you’ve been riding in a Jeep or strolling through the park on a windy day or you curled your hair yesterday, but the theme of the day is “I woke up like this”… THAT’S lived-in hair. Have you seen the gorgeous piecey, almost-falling-out boho braids? (because they’re our current obsession tbh). Lived-in waves can look a lot like beach waves, and can be achieved in a few different ways. Our obsession with them comes from the fact that they look great on basically everyone, they compliment pretty much EVERY hair color, and they exude casual beauty (which, of course, goes right along with the current minimalist makeup trend). We also love a hair trend that can be achieved through a variety of methods because some things work better for different hair types and lengths. Method One: Start off by curling your hair either with a flat iron or curling iron (we love a good flat iron curl) then comb out the curls to create loose waves. Method Two: take a section of hair, twist the hair tight, and run your flat iron down the twist. Boom. Waves. Method Three: if your hair is long enough for a braid, braid it while damp, let it air dry, then undo your braid and comb it out. Method Four: Curl your hair, wear it for a day, sleep on it, get up and go. (We gotta admit, that’s our fave.) No matter the method, a few spritzes of texture spray and a good hair flip add the perfect finishing touches to this care-free look. We talk about braids a lot because, well, they’re timeless and gorgeous, and look great on everyone. Lived-in braids, which pair wonderfully with autumn’s classic over-sized sweaters and blanket scarves, give off the same casual, perfectly undone vibes as lived-in waves. The braid version of the look can be created with a french braid, dutch braid, or fishtail. The key to making a braid look lived-in is to loosen it up by pulling gently on the outside of the braid. If a few strands fall out—even better! That just adds to the whimsical wind-blown look of lived-in braids. Invented by Johnny Ramirez of the renowned L.A. salon, Ramirez-Tran, lived-in color is thus named because it’s designed to only be done or freshened up a couple of times a year. The main characteristics include an extended darker root and hand-painted dimension, often in a balayaged ombre. The look also typically features brighter face-framing pieces (aka the “money pieces”). Lived-in color is most often a blonde or brunette color palette as it’s inspired by the natural sun-kissed hair that children magically have. The lived-in color takes a bit longer to create as it often combines hand-painting and foiling, along with requiring a root extension or smudge and always a glaze. The benefit to that longer salon visit is that you can go several months in between colors and still look just as gorgeous and on-trend as you did when you left the salon. Lived-in color is beautiful, customizable, and unique to each person. Those aspects combined with the option of flexibility in terms of how often you need to get it redone makes this trend pretty fantastic. Once you’ve got your lived-in color you can work on your lived-in waves and braids and you’ll be winning the “lived-in” lifestyle. If you’re struggling with your waves or braids, talk to your stylist about which method might work best for your hair texture and length. And don’t forget to pick up a can of Kevin Murphy’s Bedroom.Hair or R+Co’s Death Valley… they’ll be your lived-in hair’s best friends. Stop by the Garnish counter to get yours! It’s that time of year… you know the one. It begins with Memorial Day and vaguely ends at Labor Day with a huge influx on the fourth day of July. It’s COOKOUT season. Whether you call it a cookout or a barbecue, it probably involves standing around outside drinking beer or lemonade, eating grilled food, and if you live in North Carolina, trying not to melt. If you have hair that touches your neck at all, you’re probably very familiar with the sticky frizz that happens when standing outside for longer than approximately five minutes in NC. 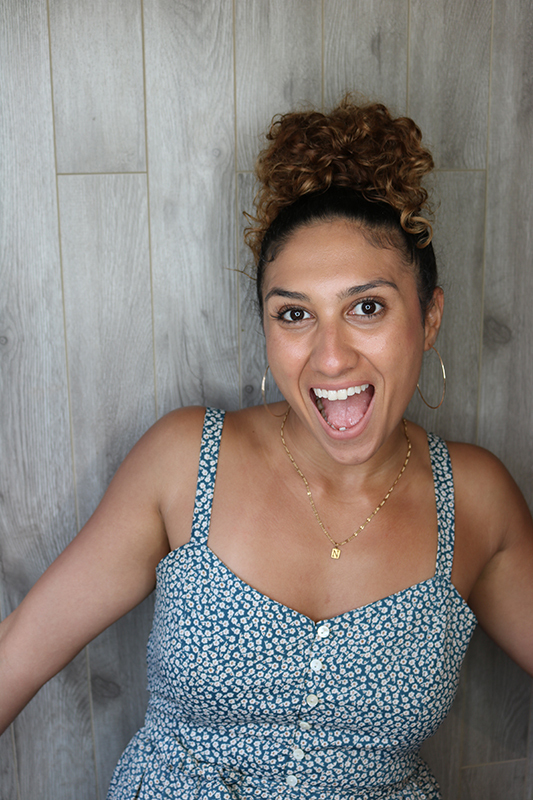 We compiled a list of our favorite cute looks for getting your hair up off your neck and surviving the humidity at your next bbq. The best thing about braids is they can be as simple as a classic three-strand braid, and as detailed as a braided updo. If you’ve mastered the fishtail braid, we LOVE a messy fishtail in the summertime. Summer seems to be the time of year when braided pigtails become cute again, and we’re here for it. However you prefer to wear your braids, they’re a super classy way to wear your hair up. You can’t beat it. Piling all of your hair on top of your head is the easiest possible way to get it completely off your neck and keep as cool as you can. The top knot can be worn slicked up sleek and tight or as artfully messy as you would like. Match it to your style, stick in a flower, or just keep it simple—the top knot can be as versatile as the many kinds of BBQs you might attend. Yup. We said it. As we mentioned with braids, pigtails just seem cuter in the summer, and they’re a fun way to put your hair up in something other than a classic pony. You can wear them low, braided, or as space buns, and they’re great for pretty much any hair type and texture. If you’ve got a handful of bobby pins, this is super simple and looks ultra classy for something you can do in five minutes. We love this for curlies, or if you’ve already curled your hair. All you need to do is take sections, twist them loosely, and pin them at the back of your head. If you have a lot of hair, or much longer hair, you can make a loose bun as an anchor into which to pin the twists. This is especially great for outdoor summer weddings and those summer soirees. Summertime can be a blast—beach trips, pool days, lake days, sun tanning, and cooking out. We tend to be outside way more in the summer, and that often means extra exposure to both the sun and water. While all of these activities are tons of fun, if you color your hair, they can be your hair’s biggest enemy. We already told you all about the super cool SU line from Davines, so to continue our Summer Survival Guide, we’re giving you our BEST hair tips and tricks for PRESERVING your summer hair color all season long. Let’s talk about the SUN first. You’ve heard the phrase, “sun-kissed highlights” before, right? There’s a reason that term came about. Sun will lighten your hair whether colored or not so if you’re out in the sun a LOT there are a couple of options. 2. Buy a really cute hat. No, seriously. The best way to protect your hair from the sun is to prevent it from being exposed to the sun in the first place. Wrapping your hair up under a hat, or wearing a hat with a wide-enough brim to keep your hair shaded from the sun will prevent the sun from reaching (and bleaching) your lovely colored locks. Let’s be real…if you’re not sitting in the sun, you’re probably soaking in the water. Both the salty ocean and the chlorinated pool can be equally damaging to your hair, so no matter which water you choose to splash into, protecting your hair in advance is KEY to preserving your color. There’s a few options for protecting your hair from the salt and chlorine. 1. Use a leave-in conditioner before swimming. This works best on already damp hair, but it’s better to use it on dry hair than to not use it at all. Bare with me while we get the slightest bit sciencey. 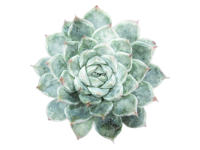 Okay, so, your hair is porous, which means it can absorb moisture. When you apply a product to your hair, it doesn’t just sit on top of the hair strands, your hair typically absorbs the product. When you wet your hair and coat it with a leave-in conditioner, you are filling the pores of your hair so that when they come in contact with salt water or chlorine, your already full hair strands will not absorb the salt or chlorine. Boom. Hair protection. If your hair is extremely porous (lightened hair), you may want to sub in a hair mask for a leave-in conditioner. The extra moisture and weight of the mask will help keep your hair full enough to avoid absorbing chlorine or salt. 2. This might sound silly, BUT, if your hair is long enough to pile atop your head, consider pinning your hair up and keeping your hair above the water. Maybe even under that cute hat you’re wearing to avoid the sun. It’s not the MOST fun solution, but it WILL keep your hair away from the damaging effects of the water. Avoid washing your hair every day. Shampooing your hair is pretty much guaranteed to fade your color, even when you’re doing everything right. Water (particularly hot water) opens the cuticle of your hair allowing the color molecules to slide on out. If you’re in the ocean or pool every day it might feel like you HAVE to wash your hair every day to get the buildup out (which is totally avoidable with the aforementioned tips), but the routine of shampooing daily is guaranteed to fade your color faster than usual. Like all of our tips, you’ve got a couple of options. 1. If you can manage to go a few days between shampoos, but feel like your hair is going to need an extra boost of shampoo to remove the buildup, try a color-safe gentle Clarifiying Shampoo. (Let me take a second to warn you that NOT ALL CLARIFYING SHAMPOOS ARE CREATED EQUAL.) Chances are, if you can buy it at your local drugstore, it’s the kind that WILL strip your color from your hair. We have four awesome clarifying shampoos here that are ALL color-safe. Kevin Murphy’s Maxi.Wash, R+Co’s Oblivion, O&M’s Detox, and Davines’ Solu. After using a Clarifyer you want to make sure to condition your hair to replenish the moisture and nutrients. 2. Invest in a bomb Dry Shampoo. Dry shampoo can absorb oils, refresh your roots, and give a little extra boost if your hair starts falling flat. Even if it just gets you through one extra day before shampooing again, dry shampoo can be a total lifesaver in terms of protecting your color. Our fave dry shampoos are Kevin Murphy’s Fresh.Hair and R+Co’s Death Valley or Badlands. Since we’re on the topic, let’s go ahead and discuss Shampoo real quick. Using a color-safe shampoo may be THE most important thing you can do to preserve your color year-round. When you invest in gorgeously colored hair, protecting it with a high-quality color-safe shampoo and conditioner seems like a no-brainer. All of our product lines include color-safe shampoos and conditioners that will maintain your color as you inevitably wash your hair. Salon quality shampoos and conditioners are designed to not just protect your color, but keep hair hydrated, reintroduce nutrients that can be lost through coloring, and target specific hair needs like rebuilding protein and offering smoothing effects. It’s important to have an awesome color-safe duo year round, but it becomes even MORE important as you subject your hair to extra wear and tear in the summertime. Finally, let’s chat a little bit about rejuvenating hair that just hasn’t been able to escape the effects of sun or water. If you forgot to toss your leave-in conditioner in your pool bag, or your hat flew off on the boat (hey, we’re giving you the benefit of the doubt here), you can rejuvenate your hair in (you guessed it) a few different ways. 1. Hair Masks are basically hair-resuscitaters. If your hair is in need of moisture and hydration, or reparation from damage, or protein rebuilding, masks are the heavy-hitters that really target these issues. Masks can be used for a variety of hair concerns, and there’s a mask for every hair texture. Using a hair mask once a week (or as prescribed by your stylist) can begin to undo the damage from sun and water. Try out Davines’ SU or NouNou hair masks, Kevin Murphy’s Young Again or Hydrate-Me Masques, or O&M’s Seven Day Miracle Masque. 2. Use that leave-in conditioner post-shower as well. Most leave-in conditioners treat the hair with renewed moisture and reparative properties, and they typically promote softness. Kevin Murphy’s Leave-in Repair or Staying Alive and R+Co’s High Dive would be particularly great for summertime hair woes. 3. Leave out the heat styling and embrace your natural texture. Whether your hair is straight, wavy, or full-on curls, using a product targeted at air drying your particular hair texture can save your hair from additional damage caused by heat styling with a blow dryer and hot tools. Ask your stylist which product will give you the desired air-dried look you would love, and fall back in love with your natural tresses. Alright, SO. Let’s sum it all up. PROTECTION is key from both the sun and water, but when you can’t protect, SHAMPOO less, using salon-quality products, treat with leave-in conditioners or masks, and let your hair air dry for minimal further damage. It IS possible to survive the Summer with your gorgeous color in tact so long as you take a little extra effort to care for your investment. As always, if you need help figuring out what is the right prescription for YOUR hair and YOUR Summer activities, chat with your stylist at your next visit or give us a call. First up—if you followed Coachella at all this year, you’ve already seen this trend. Space buns are everywhere, and can be worn in a versatile mix of ways. The key with space buns is the high placement on your head. (Y’know, as if you had kitten ears?) 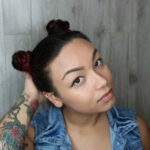 Space buns can be worn with all of your hair wrapped up into the knots or in a half up, half down fashion. They can be sleek and tight, or messy and loose. We love a trend that can be customized to your own personal style and look. Our next fave trend is the ever fabulous beachy waves. If you’re lucky enough to have naturally wavy hair, well, we’re all jealous. And if you don’t, but want to achieve the same effortless look, a curling iron or wand is your best friend. 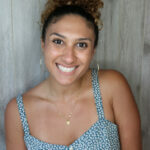 Brushed out curls with a spritz of sea salt spray can recreate that lived in salt enhanced look. 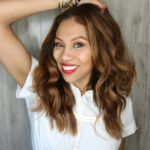 Candice’s beach waves get an extra boost of length and volume with secret halos! A halo is a great way to add a bit of length and volume to your hair in an easy, at-your-convenience sort of way. Where my pixies at? Sometimes it can feel like you’re limited in the versatility of styling your short hair, and that can be frustrating. Our resident pixie, Christine, likes to mix it up by wearing and styling her bangs in different ways. 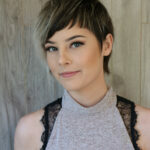 Baby bangs are a fun sassy addition to a pixie, and the quick grow out means it doesn’t have to be a long-term commitment. You can even mix it up with baby bang lengths, and have one side a little shorter than the rest as Christine is currently rocking. Every long-haired lady in the south knows that wearing your hair down in the summer can sometimes be absolutely miserable. This is why we are obsessed with ballerina buns. It’s cute, stylish, and classy all at once AND your hair is up off your neck and out of your face. This is especially important for frizz-prone ladies—any style that lets you spray down the frizzies or embrace them with a messier look is a necessary addition to your hairstyle arsenal. Our final summer ’17 hair obsession is a classic—BRAIDS. This is another style that you can totally customize based on your look and hair. Braid back just the front, french braid it all, or add a couple of braids together for a boho look—we love ‘em all. Learning to braid your own hair might take a little practice, but it’s a fun way to add a little something different to your daily hair style. You can even add in some sparkle with hair jewelry like Tish has! Alright, gems, you’re all ready for the NC heat and humidity with these summer hairstyles. We would love to see your own interpretation of the Garnish Summer Trends. Most hair trends come and go or at least fade in popularity year to year, but there’s one trend that has definitely proven it is here to stay. BALAYAGE. (Bah-lay-ahj) is the hand painted technique that originated in the 70s and began its reintroduction into popularity midway through the first decade of the 2000s. 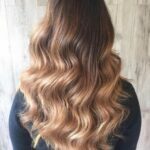 Starting to become popular with a subtle sun-kissed look, balayage has evolved into an incredibly versatile art form—a favorite of both stylists and clients alike. The customizable nature of balayage broadens its appeal making it accessible to essentially all hair types, textures, and colors. Everyone from fine-haired blondes to brunette curly girls are digging this color style. Like most art forms, balayage techniques vary by stylist. 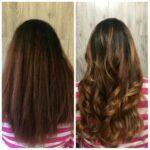 The key to achieving your ideal balayage look is finding a stylist whose style you love, and having a thorough consultation with your stylist. At Garnish we pride ourselves on our unique color consultation process that ensures our guests leave absolutely in love with their hair color. 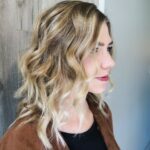 Because balayage can vary so drastically, the consultation allows you and your stylist to talk about your #hairgoals, look at photos of balayage you love, and put a game plan in place for your new look. Balayage can be as subtle or as bold as YOU want. It can be blonde, brunette, red, or a fashion color! Once the balayage is in place, you can change up the tone with a different glaze every 4-6 weeks. (My gals who like to change their color frequently, this is KEY for you). No one else’s hair will ever look quite like yours because no two pieces of art look exactly the same. Your hair is literally a one-of-a-kind masterpiece. How COOL is that?! “Trendy” can sometimes get a bad rap, but a) balayage has proven it’s more than just another hair trend, and b) who DOESN’T like to share the look of their fave celeb #haircrush?! 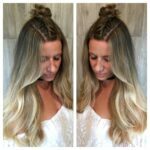 Check out some of our favorite balayage looks from The Garnish Team below, and even more in our Handpainted Gallery!